I’ve lived here 17 years without a single visit to the Orange County Fair. Fearing that the mere fact might physically force me out of California’s borders, I made a commitment to find my way there this summer. This year, the OC Fair rolls through Aug. 13th (next Sunday), so I figured opportunity would find its way to my door. Within hours, one of my girlfriends called out of the blue to ask me to the OC Fair. Her husband’s band, Members Lonely, was playing for just 45 minutes which, apparently, is standard protocol at the Orange County Fair. We arrived at 11:00, just in time to catch the band. Even just an hour after the gates opened, the place was hopping. At least 100 people had found their way to the Members Lonely performance and, even more surprising to me … at 11:00 a.m., long lines on either side of the stage were queued up for big draft beer pours. Now, Terri is a Significant Foodie. By “significant,” I mean she’s willing to try just about anything. Too many times, I meet self-described “foodies” who proceed to tell me that they can’t stand this protein, that green, this type of sauce or any kind of fish served with their heads still attached. To me, this is not a Significant Foodie. Happily, Terri stands proud at the top of my Foodie estimator, and we strolled about quite cheerfully with our intent in mind. As we walked and walked and walked, the grounds filled quickly. This was mind-blowing to me as this proved a much larger space than I had imagined, sprawling 150 acres. The O.C. Fair began in 1889, has been in operation every year since 1916, and runs 23 full days, putting it in the top 6 longest-running state and county fairs of the year (San Diego County Fair tops them all at 26 days). There are carnival rides, a kiddie carnival, livestock shows (with milking demonstrations! ), giant vegetable winners on proud display, olive oil competitions, SPAM Championships, culinary chef demonstrations, arts and crafts galore, wine seminars, and even crazy, action sports from Extreme Rodeo to monster trucks, demolition derbies and “Motorhome Madness” and even All-Alaskan Racing Pigs (really?). The OC Fair brings in more than 1 million visitors – an average 43,000 every single day. (Who knew any other O.C. entity could rival what we see jostling in Laguna’s streets every summer day?!) On Sunday, it felt like all 1 million visitors were there right with us. What a crazy, amazing, people-watching kind of overload. 2.) Giant edifices paying homage to food in giant portions. It’s never a difficult search to find fried foods, let me tell you. 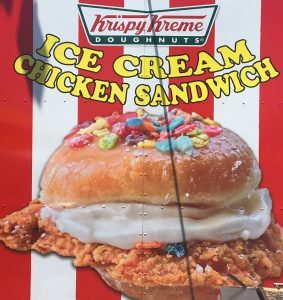 This year, the hottest selling item seems to be a Krispy Kream Ice Cream Chicken sandwich – the famed Doughnut loaded with a giant scoop of ice cream, a slab of fried chicken, and a hearty sprinkle of Fruity Pebbles. Fearing this might just put me in cardiac arrest, Terri and I opted for bites of returning fried food visitors. We started with Fried Pickle Poppers stuffed with Jalapeno Cream Cheese. 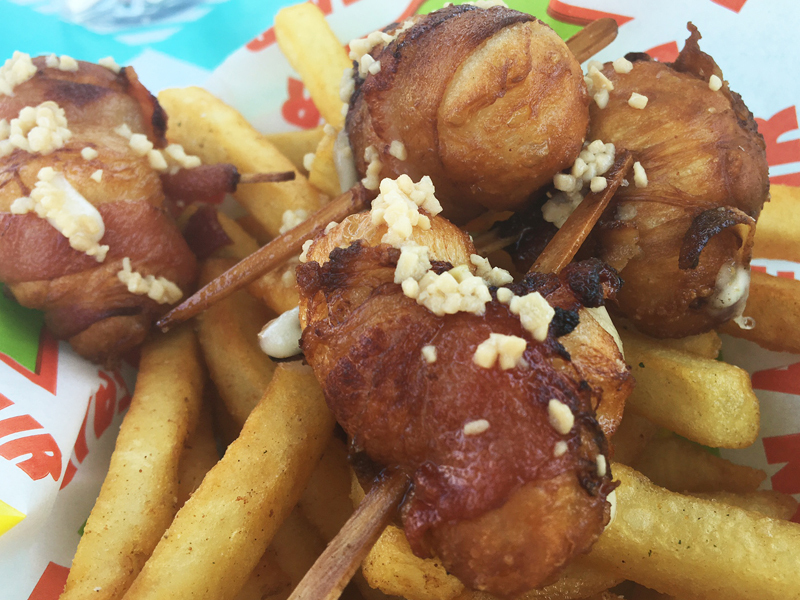 Foodie report card: The poppers were too large – we expected 1- or 2-bite size. The pickles were too large inside the fried bits, and still a bit cold. Jalapeno cream was good, but could have been more plentiful. Overall rating: 2 out of 10. 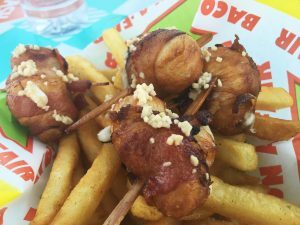 From there, it was Fried Bacon Wrapped Cheese Bombs. 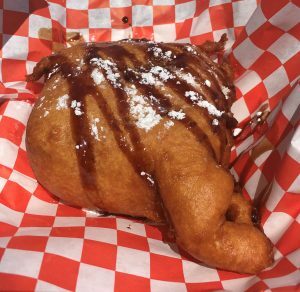 Foodie report card: Bombs definitely performed better than the poppers, but a bit too much of the fried stuffin’ going on. They arrived atop a giant amount of French fries, which were rather bland. Then, it was on to Fried Australian Stuffed Potato Planks. Ever hopeful, we then stood in line for the last item of the day – Fried Klondike Bar. 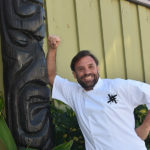 Foodie report card: At last! Of course, there can’t be much that can go wrong with a brick of ice cream, chocolate and flash-fried coating … except, of course, that it melts quickly into a puddle of goo. We weren’t complaining. Next year, I’m making a beeline for the fried Klondike bar, finding a seat at the Members Lonely bandstand. From there, it’s a trot over to the Wine Society’s center courtyard for a great discovery in Chardonnay, and spending the remainder of the hot afternoon in the shaded confines of the OC Fair’s culinary demonstrations. See? There’s something for everyone here!